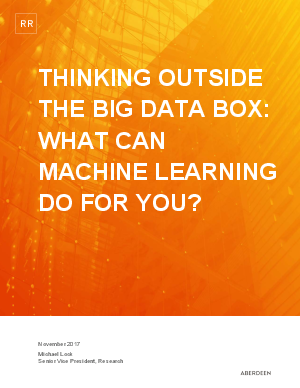 > Amazon Web Services > Thinking Outside The Big Data Box: What Can Machine Learning Do For You? Future-proofing a business has never been more challenging. Customer preferences turn on a dime, and their expectations for service and support continue to rise. At the same time, the data lifeblood that flows through a typical organization is more vast, diverse, and complex than ever before. More companies today are looking to expand beyond traditional means of decision support, and are exploring how AI can help them find and manage the “unknown unknowns” in our fast-paced business environment.